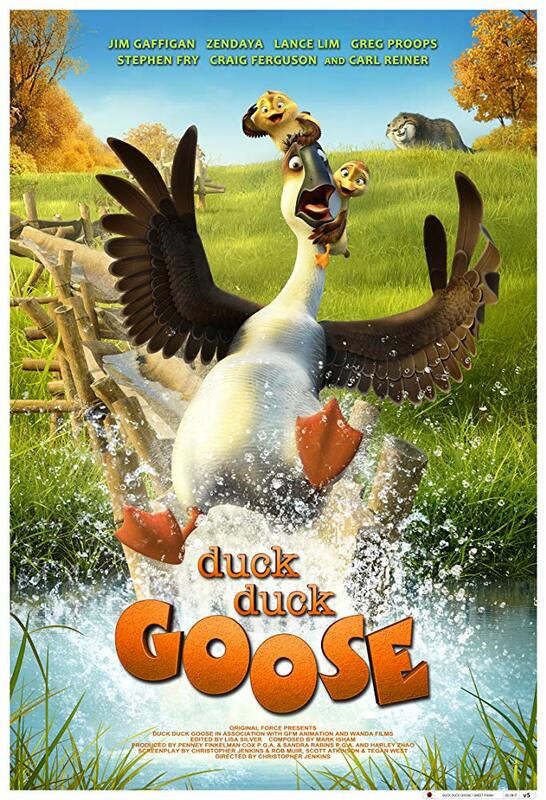 After he's grounded by an injury, a high-flying bachelor is saddled with two wide-eyed orphans as they come face-to-face with the dangers and beauty of the outside world in this funny and touching animated feature, "Duck Duck Goose". Our free-wheeling hero, Peng (Jim Gaffigan), rejects the community of his tight-knit flock of geese in an attempt to live life on his own terms. But after he narrowly rescues two young ducklings, Chi and Chao (Zendaya and Lance Lim), from an eccentric but deadly cat named Banzou (Greg Proops), the two latch onto the Goose like a parent; and with a paralyzing winter on the horizon and the departure of both their flocks, Peng agrees to look after the ducklings out of fear his injury might be discovered by Banzou, and other predators who would prey on a goose who cannot fly. The makeshift trio embarks on a beautiful and dangerous journey through mountains and lakes, bamboo forests, marble caves and deep river valleys to reach their respective flocks. On the way, Peng must learn to care for the two ducklings despite his independent attitude, all the while evading the hungry and relentless Banzou, who'll stop at nothing to claim the ducklings he feels entitled to.